Moeller GmbH, a major innovator in switchgear and safety solutions for a wide range of industries, used MSC ADAMS for studies and calculations in new switchgear development, and to analyze improvements in existing products. Moeller engineers performed various tests on the same virtual model, inlcuding forces and load calculations, resulting in fewer physical prototypes and high-speed recordings. Thanks to MSC ADAMS, Moeller reduced the development time of new and modified products and improved the quality of existing products. In order to effectively protect machines and engines, the circuit breakers must operate as predicted and therefore must be tested beforehand. Experimental hardware tests of circuit breakers require the building of a realistic prototype including all essential sub-assemblies and all necessary materials, making these tests laborious, time-consuming and expensive. Before using computer-aided engineering (CAE) software, the AE engineers performed motion analyses of their switches using high-speed video recordings of the physical prototype. Static calculations were done manually with functions and loads - a demanding and tedious method, and a major handicap in the field of advanced engineering. Since computer-aided design (CAD) software was already in use at Moeller for switch development, it was a logical step to implement CAE software for functional analysis of the switchgear. 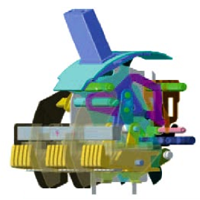 Among several software packages, MSC ADAMS was chosen to be the most suitable for multibody simulation because it enables the engineers to perform a complete analysis of the assembly as well as dynamic calculation of the loads. The MSC ADAMS post-processor offers significant plots and animations, which quickly reveal the right development direction.